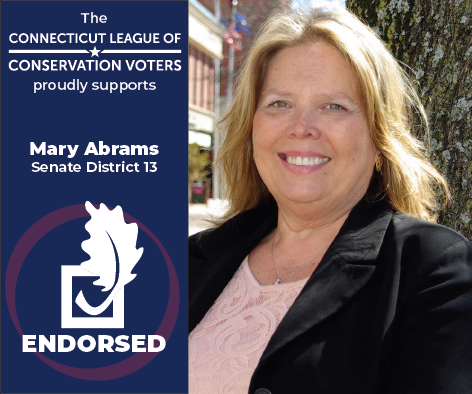 The Connecticut League of Conservation Voters (CTLCV)—a bipartisan organization dedicated to protecting our environment by making it a priority for our elected leaders--endorsed Mary Abrams (D) to represent the 13th Senate District. Abrams is a former school teacher and administrator, and passionate about protecting our environment and leaving the world a better place for her grandchildren and future generations. In contrast to her opponent Len Suzio--who was one of the lowest scoring lawmakers in CTLCV’s 2018 Environmental Scorecard--Abrams expressed strong concerns about exposing our kids to toxic tire mulch on playgrounds and carcinogenic flame retardants in their clothing. HB 5329: This bill would have banned the use of carcinogenic flame retardants from children's clothing. These flame retardants are not only toxic, but also produce more smoke during fires, making it more difficult for firefighters to locate children. Suzio voted against this bill and worked hard to prevent it from becoming law. HB 5188: This bill would have banned toxic crumb rubber from being used in playgrounds at school and public playgrounds. Suzio voted against it and worked hard to prevent it from becoming law. Suzio's appalling environmental record landed him on LCV's Dirty Dozen In the States List, which tracks the worst anti-environmental state lawmakers in our country. Now more than ever, we need leaders committed to our environment. As an educator, Mary Abrams has been an advocate for children's safety and public health for years. She also signed CTLCV's Clean Energy for All pledge, vowing to transition our state to 100% clean energy by 2050. With the latest reports from the United Nations saying we only have 10 years to cut emissions before climate change causes a catastrophe, it's clear we need lawmakers dedicated to putting our environment and our future first.